There are many ways to make Paella. 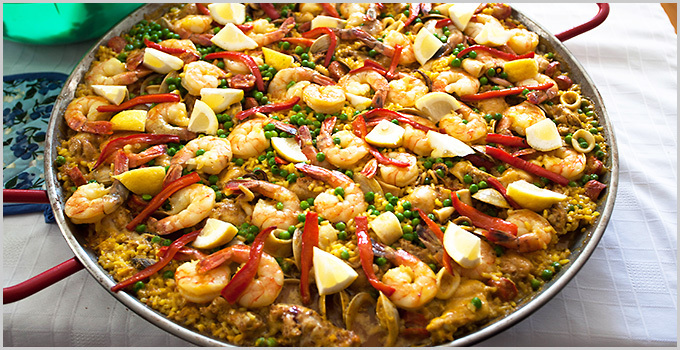 It is fun to make it a little different each time you cook a Paella. I love cooking Paella outdoors. I have a Paella burner that hooks up to my house gas line. You can also use Paella burners with a propane tank. In the winter I cook my Paella on the stove cook top. Calamari rings and tentacles – 3/4 lb (leave out if using rock fish). Squeeze lemon out of wedges and place lemons on paella. * I am always a little cautious with chicken so before hand, I season the chicken and cook it in the oven for 25 minutes at 375 degrees. So it is almost cooked when I add in to the cooking Paella. ** I use Bomba rice. It is a little more expansive and sometimes are to find at the stores. You can order it online. My Dad also loved cooking Paella but he used good old long grain rice, go figure! *** I soak the Saffron in about a 1/4 cup of white dry wine for about an hour.